The news this week out of Iraq is sobering and alarming. As the crisis deepens, we were reminded of a story from three years ago, about Iraqi Christians seeking refuge in the northern part of the country — a region that has now been overrun by insurgents, amid reports of hundreds of thousands fleeing the area for safety. Mosul serves as the nerve center for the region’s extremist activities. Though historically a Sunni metropolitan area, the city and its surrounding villages were for centuries also home to an array of vibrant minority communities, including Christians, Kurds, Turkomans, Mandaeans and Yazidis. And until the fall of Saddam Hussein’s regime, these diverse groups coexisted more or less peaceably with one another and the Sunni majority. But as militant groups gained control of the city in the war’s aftermath, violence against these communities escalated. Most Christians have left in recent years. In 2008 alone, more than 2,600 Christian families fled the city following a string of violent attacks on the community. Salam Talia and his family know all too well the hardships of living in a post-Saddam Hussein Mosul. Fearing for their lives, the family kept a low profile in the city for years. They never disclosed their Christian identity and actively disguised it. The family refrained from attending church. Mrs. Talia and her daughter-in-law began to cover their heads, following Muslim practice. And while a student at Mosul’s fine arts academy, Salam Talia expressed interest in Islamic calligraphy, often choosing passages from the Quran as the subjects of his paintings. These efforts, however, were in vain. Salam Talia narrowly escaped two separate kidnapping attempts. And while he was riding a university bus, a roadside bomb blew up the bus driving directly behind his. Finally in November 2007, tragedy struck the family. The eldest son, a police officer, died in an Al Qaeda attack on a police station. Just weeks later, extremists raided the daughter-in-law’s family home, slaughtering the young woman, her parents and a brother. Devastated and terrified, the Talia family hastily moved to Hamdaniya. 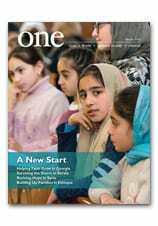 Read more about A New Genesis in Nineveh in the November 2011 issue of ONE. And to help support Iraqi Christians during their hour of need, visit this page — and please, keep them in your prayers.